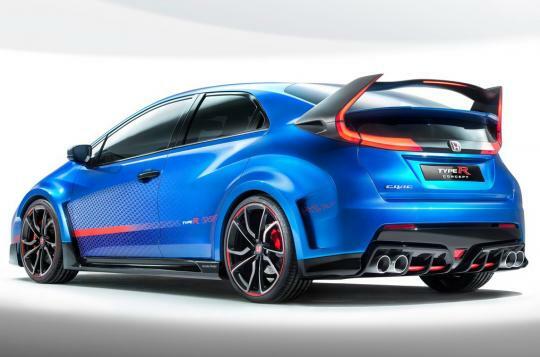 Honda has sent hot hatch fans into a frenzy by unveiling the first pics of its latest Honda Civic Type-R concept ahead of its 2014 Paris Motor Show debut. 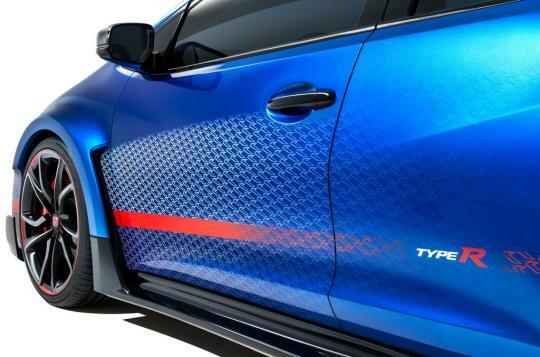 Forgoing the classic Civic Type R red in favour or an eye-catching blue paint-job the concept is revealed along with extensive details and specs. 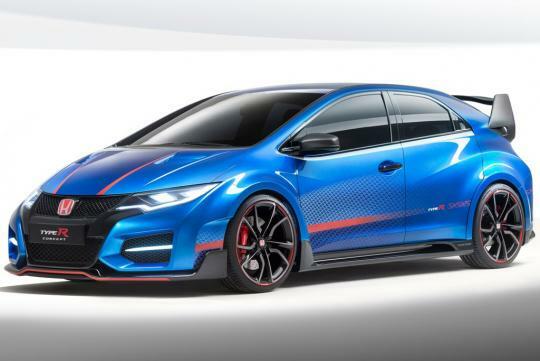 It looks certain that the eagerly awaited hot hatch version of the Civic will be one of the most extreme and performance-focused models in the Type R’s 22-year history. This lightly redesigned preview retains the enormous rear wing, quad exhausts, racing-style rear diffuser and wild bodywork of the previous concept, seen at March’s Geneva show. Yet Honda has lifted the lid on some of the state-of-the-art tech that will power the car under the surface. It’s no secret that Honda is chasing the front-wheel-drive lap record at Germany’s Nurburgring race track with the hot Civic and, in its quest to succeed, a new 2.0-litre i-VTEC turbocharged engine will be its trump card – the first turbocharged engine to be fitted to a Type R model. And, like every flagship Civic before it, the newcomer will only be available with a six-speed manual gearbox. Honda is reluctant to disclose final specs, but it has promised in excess of 278bhp – more power than the 3.0-litre six-cylinder engine delivered in the NSX Type R supercar. Unofficially, that should ensure the new model cracks the 0-62mph sprint in around six seconds. Helping ensure all that oomph doesn’t dissipate into plumes of tyre smoke, the Civic Type R will feature a new steer-axis front suspension set-up. In practice, the system will allow drivers to extract maximum performance by reducing torque steer and smoothing out power delivery to the front wheels under hard acceleration. Another feature to debut on the Civic is the +R driving mode. Enabled via a button on the dashboard, +R sharpens up the responsiveness of the engine, extracts greater performance from the turbocharged motor and gives the steering more weight. 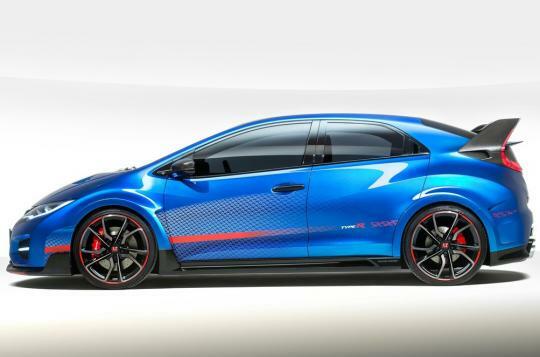 the Type R will also feature a new four-point Adaptive Damper System. This has been specifically designed for the new model and is able to manipulate the firmness of the front and rear dampers automatically depending on the driving conditions. At slower speeds or when cruising, the dampers will automatically adjust to a softer set-up to provide a more comfortable and supple ride. Yet with more aggressive driving, the dampers will become noticeably firmer to serve up better body control and greater agility. Currently being developed and engineered at Honda’s plant in Swindon, Wilts, the all-new Civic Type R will arrive in showrooms early next year, priced from around £30,000 – somewhere between the Golf GTI and four-wheel-drive Golf R.